Put 5 leaves of gelatine in a bowl of cold water (they have to be fully covered) and set aside for 5 min. In the mean time, put 400 ml double cream or whipping cream (you need at least 30% fat contents) in a pan with 150 ml milk, 100 g caster sugar and 1 tsp vanilla extract (or the seeds of a vanilla pod) and stir to combine. Gently heat the mixture while stirring occasionally until it’s almost boiling. 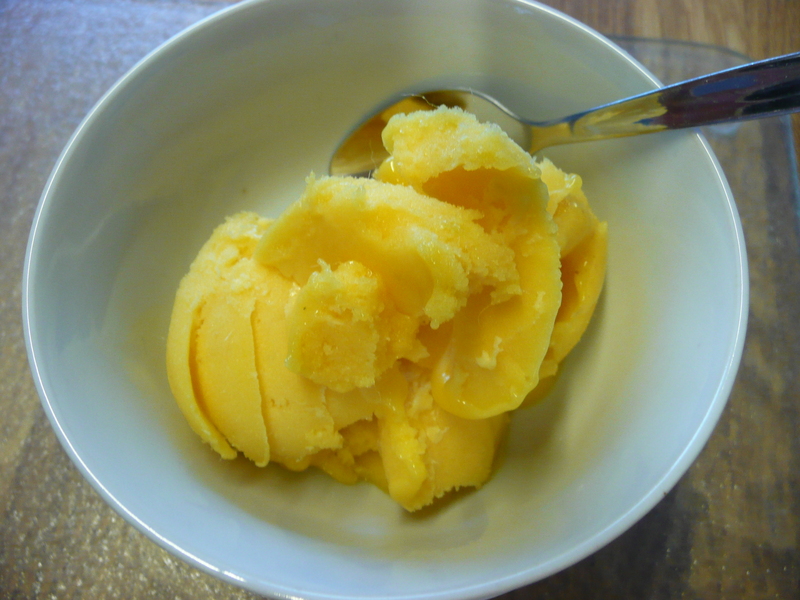 In the mean time, peel 1 to 2 mangos at room temperature, cut into chunks and mix in a blender until smooth (1 mango gives a subtle taste, two will make it more pronounced). Add the hot cream to the blender and blend again until smooth. Check if the mixture is still quite hot, if not you can heat it through a bit. Add the crushed seeds of 5 cardamom pods (the flavour will come through very well, if you prefer it to be subtle, stick to 3 pods instead). Take of the heat and add the gelatine leaves one by one (squeeze out all the water first) and stir well. Pour the mixture into dariole moulds and put in the fridge to set for 2-3 hours or overnight. To unmould the panna cotta, dip the bottom of the moulds in hot water for a few seconds to loosen them, then turn them upside down on a serving plate. They may need a few sharp jerks of the hand for them to come out. If this fails, run a small knife around the side of the mould to loosen slightly. Or just don’t bother taking them out of the moulds at all. 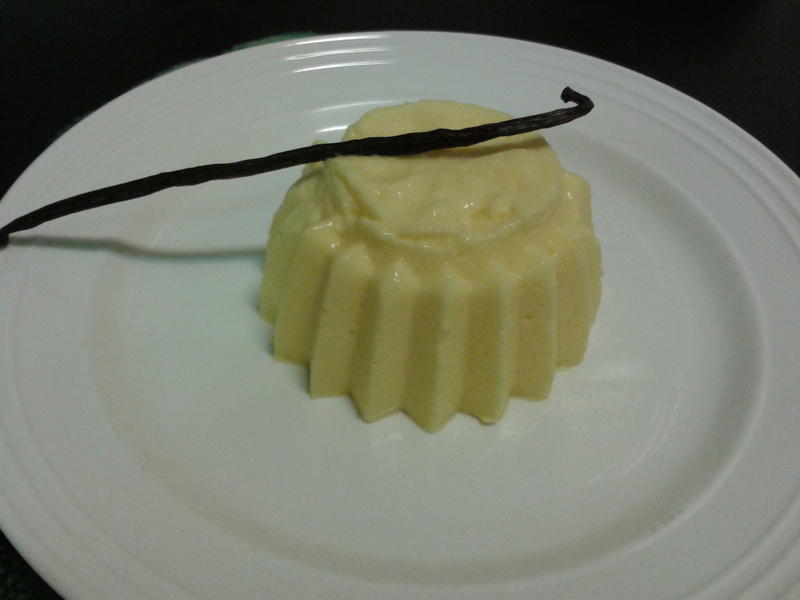 I served the panna cotta on it’s own, but if you prefer you can add some raspberry coulis as well. Enoy while listening to Sunrise by Norah Jones. Use up some cardamom in a cardamom loaf or a chocolate and cardamom mousse. 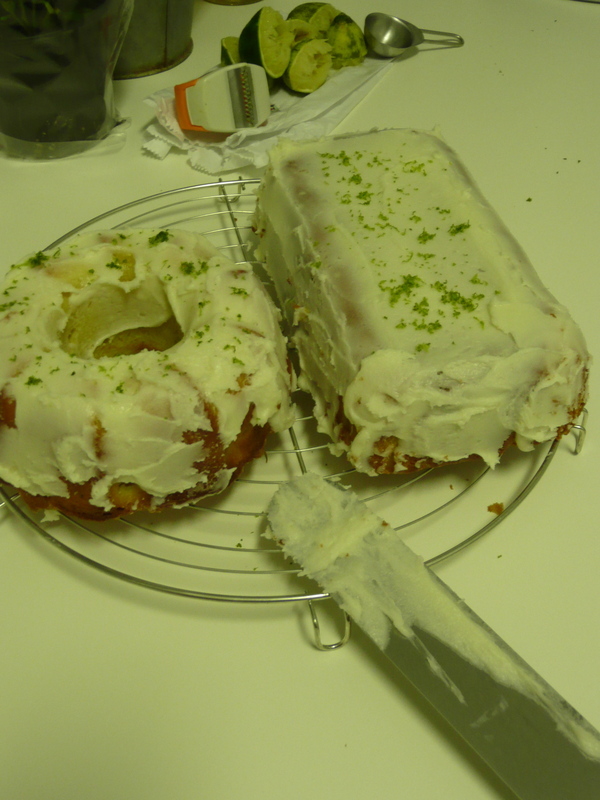 If you got more mangos than you can handle, try a lime and mango cake.